On The Whole: Reaping profits from the "diseasing" of "obesity"
Reaping profits from the "diseasing" of "obesity"
An ad in the January 2008 issue of Entrepreneur magazine exemplifies the profit (or promise of profit) to be made in selling the concept of fatness -- err, "obesity" -- as a disease. Because, you know, if you can convince people there's a problem, you can sell them a purported solution. And make lots of money at it. 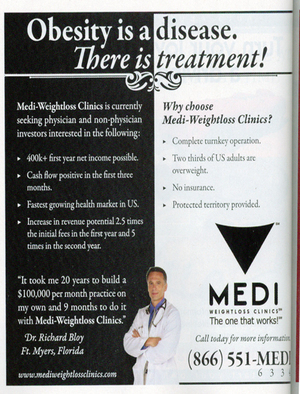 The ad is selling franchises (or "seeking investors") for Medi-Weightloss Clinics. But notice the ad's pitch: "Obesity is a disease. There is treatment!" 400k+ first year net income possible. Cash flow positive in the first three months. Fastest growing health market in US. Increase in revenue potential 2.5 times the initial fees in the first year and 5 times in the second year. "It took me 20 years to build a $100,000 per month practice on my own and 9 months to do it with Medi-Weightloss Clinics." Notice that the tag line for the business is "The one that works!" Yeah, right. And the data proving that are just where, exactly? Don't get me wrong -- it's not that I think physicians shouldn't make money. On the contrary, I think they deserve to earn a good income. And I can certainly appreciate the appeal of "no insurance" -- I quit accepting/processing insurance myself in my practice a few years ago for several reasons. But remember the promise to "First, Do No Harm?" Marketing "obesity" as a disease and selling weight loss as a "treatment" is harmful in several ways. It reinforces and promotes fat hatred and body shame, as well as discrimination against the people considered "diseased." It reinforces and promotes eating disordered ideation and behavior. It increases the likelihood that fat people will receive poor (or no) legitimate health care for any real diseases or conditions, due to the tendency for perceived "excess" weight or weight gain to be viewed as a problem for which weight loss is the (supposed) cure -- rather than as, if anything, a symptom (or medication side effect) when not simply a matter of human diversity. Not to mention the tendency for many women, especially, to avoid health care for fear of feeling shamed about their weight. It reinforces the erroneous notion that weight/fatness is under personal control (albeit with the "help" of the diet-pharmaceutical-weight-loss industry) and thus that fat people who remain fat, or who return to fatness after what is almost always a temporary weight loss (because ALMOST EVERYONE WHO LOSES WEIGHT THROUGH DIETING GAINS IT BACK WITHIN TWO TO FIVE YEARS) are just lazy, gluttons, lack willpower, or (insert stereotype here). I'm not really posting the ad here to try to convince physicians or other "investors" to avoid participating or supporting businesses that foster fat hatred and potentially harmful obsessions with weight -- although it'd be nice if that happened. No, I'm posting the ad here in hopes that someone who is considering the services of any weight-loss-oriented business, particularly those marketed under the guise of health concerns, will keep in mind that ultimately, that business is about making money. Not really about health. What do the 'no insurance' and 'protected territory' mean? This ad is truly, truly disgusting. This goes far beyond snake oil. Profiting off the misguided hopes and dreams of people while simultaneously performing a life-altering surgical procedure that poses very real health consequences and even death is not just medically irresponsible, it's morally bereft. Thanks for posting this, Peggy. And notice the exact pairing up of "disease" with "treatment" and the obvious, literal black and white mentality this ad displays. So very blatant. "Medi-Weightloss Clinics is the physician supervised program that uses a prescription appetite suppressant, a diet plan, and moderate exercise to help you shed unwanted pounds rapidly and keep them off!" Wow! Like no one has ever tried THAT before! Call the Nobel committee! Orodemniades, I took the "no insurance" to indicate that the business/program is set up for patients to pay out of pocket -- no insurance billing and managed care hoops to jump through. That's attractive to any health professional frustrated by dealing with insurance & managed care -- which essentially means any health professional dealing with insurance & managed care. I bet "protected territory" means they'll promise not to set up another franchise within a certain range of "your" business, so as to prevent competition. Kind of like guaranteeing that yours will be the only McDonald's within an X-mile radius. Didn't statistics show that obesity has leveled off in the last couple years? Not exactly the "fastest-growing" market, in that case. Wow! You people must not have ever had a weight problem! I lost 50 pounds on this diet! Do you have and idea how that changed my life!? Gosh, silvia, I've never heard THAT before. [Sarcasm alert.] If you're a real person, please report back to us two to five years after your "life-changing" weight loss and let us know how much you've regained. BTW, your two subsequent comments listing the URL of the weight loss clinic business have been deleted. As will be any other comments promoting weight-loss businesses.